A Toronto father and artist who has been identified by police as the skateboarder killed in a hit and run in North York early Monday is being remembered by his friends as the "king of Kensington." Andre Alexander, 34, was riding his electric longboard eastbound on Sheppard Avenue East near Yonge Street when he fell and was struck by a vehicle travelling the same direction, said Det. Const. Scott Matthews of Toronto police's traffic services division. The female driver of the car — identified as a silver- or grey-coloured Toyota Yaris — briefly "stopped, got out of her car and went to the male lying on the ground," explained Matthews. "There was a brief interaction, then she went back to her car and left the scene." 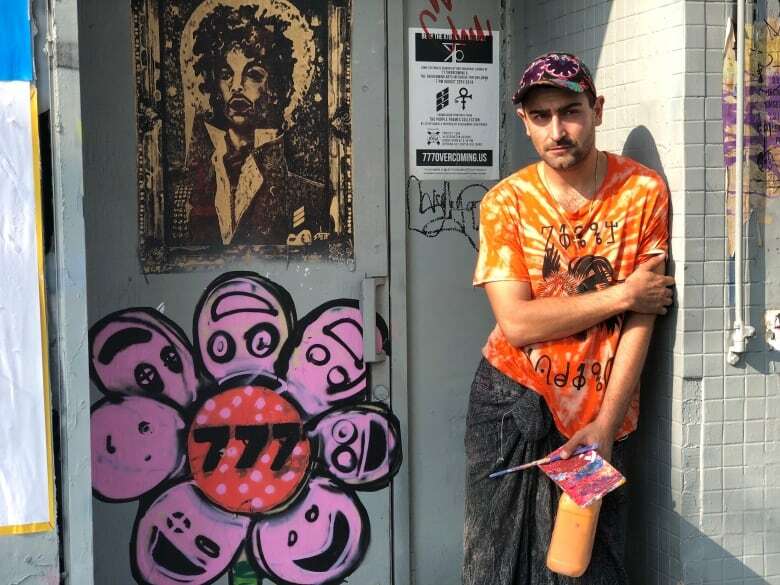 Alexander was well-known in Toronto's arts community for his painting and printmaking, and eventually started using the name Hip Pop Art, his friends say. He had a young daughter. Alexander sold his work in Kensington Market, a popular downtown neighbourhood whose streets are lined with eclectic vendors. "He was a super great guy, really motivated to succeed," recalled Abi Roach, owner of HotBox Cafe in the market. "He was always out selling his art and always creating new things that were really unique." Alexander also secured a printmaking residency at the Gladstone Hotel's Art Hut in early 2017. Local artist Steep Daniels told CBC Toronto on Tuesday that Alexander was a fixture in Kensington Market. He plans to paint a mural of Alexander on the wall of a shop to honour his legacy and contributions to the area. "I'm going to make him an icon now because he was an icon in our community," said Daniels who spent the last two years painting alongside the artist. "He was really about design and looking nice ... He was always smiling and he was the person of the community and that's what he's going to be remembered as." A GoFundMe page has been started to help cover the cost of a funeral. In just one day since its launch, the page has raised $3,400 of its $5,000 goal. Investigators are still searching for the driver of the vehicle. The suspect is described as a woman, believed to be in her 40s, with black, shoulder-length hair.